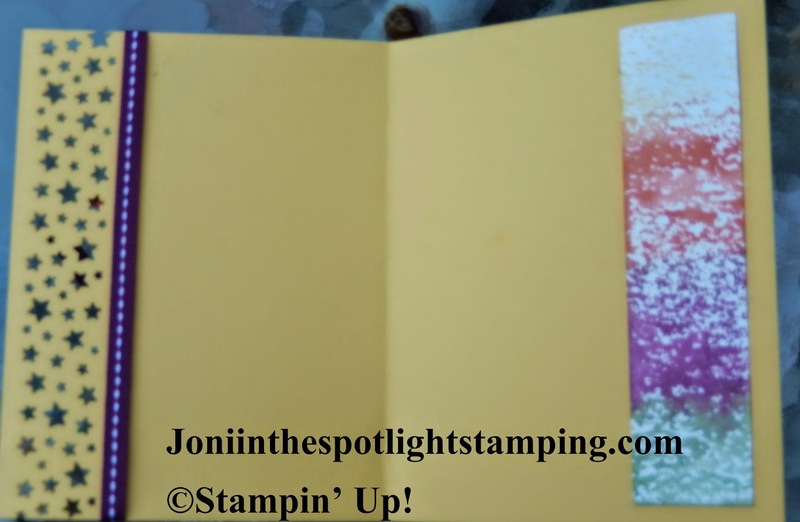 Joni in the Spotlight Stamping: TAKING THE PLUNGE WITH WATERCOLORING! This week's challenge over at The Paper Plunge is an appropriate one-watercolor! The Design Team has created some great ideas for you! Can't wait to see what YOU will add!!! I love the "softness" of watercolor. I also love the versatility. It's basically anything that involves water-in whatever way! Stampin' Write Markers for the watercolor effect. Wanna know how? Contact me! I'd love to do a class for you & your friends!!! I love the Be the Star stamp set!!!! It's so versatile!!! Any occasion. Any color. Any design!!!! 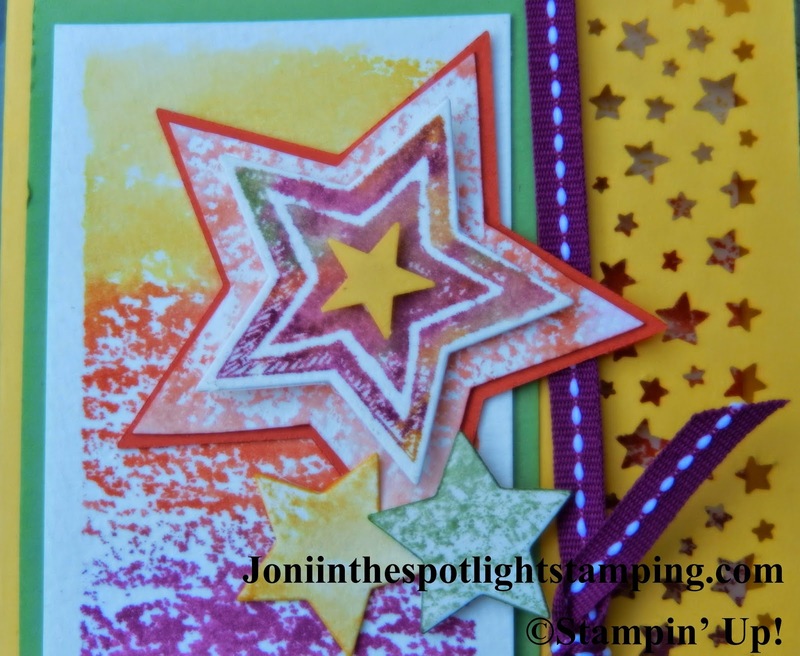 And you throw in the matching Star Framelits to cut the stars out & you got a winning combo! The little sentiment in the corner is from A Dozen Thoughts. Now that Star Border Punch makes quick a statement!!! 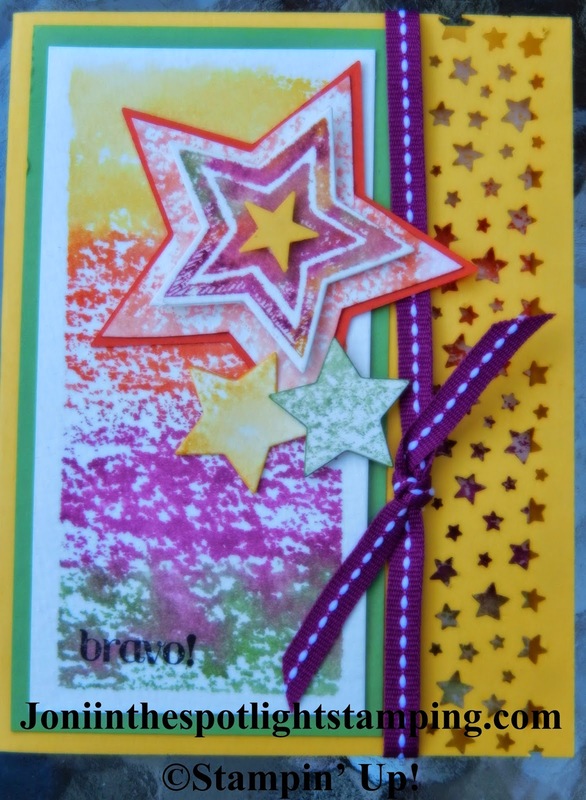 Not only do you get a great border, but you also have all the little star confetti to play with! And clean up!! lol It even leaves a little window to the inside! Be sure to add a little visual treat there!!! Swim Team Members (winners!) of last week's challenge!!!! Some beautiful submissions!!! Keep 'em coming, and be sure to visit the beautiful blogs of both the Design Team & the Swim Team!!! We LOVE visitors!!!! Such a fun card, Joni! I love how you created your own designer paper background! Love this card Joni! I will be using your idea! Hi Joni! What a happy cheerful delightful card! You are a STAR! BRAVO! What a fun and colorful card, Joni. Very nice!!!!! !